2) Enter your Mobile Number & Pin code. 3) You will get the Successful Message on your Screen. 4) Now Wait for 22-December-2015. 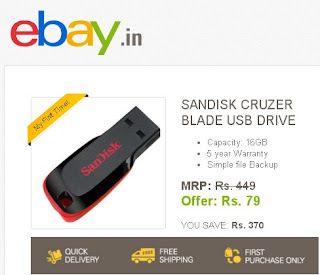 6) You need to Buy the Pendrive with that Promo code as soon as Possible because its valid for limited time only. 7) So Hurry up and Create your New Ebay accounts because its valid for New users only.